Award winning playwright, poet and children’s author (a few of his many talents), John Agard is an overall performer of the written word; a master of language. This is reflected in his new edition of poetry which follows his wicked The Young Inferno, which updates to modern, Dante’s magnificent work. 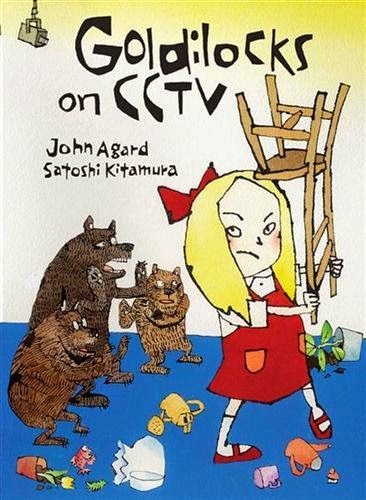 In Goldilocks on CCTV, Agard transmogrifies in a surprising and eloquent way, familiar childhood fairytales into rap, or hip hop rhythm, with a new slant on each tale. He begins by stripping away the original framework of the tale, to build a new one with the same basic equipment for modern verse lovers. Imaginative mixes, wordplay, role reversal, imitation, and re-evaluation of all you read in your childhood takes place here. Totally magical and creative, he brings the past into the now and assuredly will draw further on the new audiences that are drawn to this modern style. This out-there verse is perfect for performance when captured or spoken in the correct rhyme and rhythm. The fantastic, bizarre and inventive art/illustrations in black and white by Satoshi Kitamura, are shadows to the clever lyrics/text.